The printing press, movable type, the type mold, and the invention of printing ink for use on metal type face are all attributed to Johannes Gutenberg (ca. 1394?-1468). The first book printed by Gutenberg's press was the famous 42-line Bible, published 1455 in Mainz, Germany. In 1452, Johannes Gutenberg, a goldsmith by trade, conceived a printing press that used movable (replaceable) type. In his workshop, he brought together the existing technologies of linen paper, oil-based ink, metal working and wine-press mechanics to print books. • the adaptation of the goldsmith’s punch and die, used to strike coins, into a letter punch and mold assembly that made possible the mass production of removable type-face letters. This replaced wood-cut (fixed image) block-print technology - that had been known in Europe since the return of Marco Polo from Asia at the end of the 13th century. • the adaptation of the screw-type press that had been in use throughout Europe and Asia for hundreds of years by European textile makers to print patterns on linen fabric, as well as by vintners in the production of wine and olive oil. • the development of mass production linen (rag) paper-making techniques. Scrolls of hand-made silk and later linen paper were brought from China to Italy in the 12th century. Linen paper took too long to make by hand and silk was thought too flimsy for books. Prior to Gutenberg’s printing press, books made in Europe were hand-scribed on vellum parchment (calf or lamb skin), preferred because of its durability. • the development of oil-based inks that were suitable for printing on linen paper. These had been around since the 10th century, but tended to smear on the vellum parchment used to make religious manuscripts, which was not porous enough to take the ink. The vellum manuscripts were hand-scribed with an egg-based tempura that was unsuitable for printing with metal type. Gutenberg took advantage of the existing technology of oil paints, which came into general use after they were perfected and popularized by European artists. Little modification was needed to turn oil paint into printing ink. Gutenberg assembled individual type-face pieces as a matrix of up-turned letters in a cabinet drawer. Oil-based ink paste was applied ("beaten") onto the letter faces and a pre-cut linen paper sheet was pressed down against the inked matrix by a screw press, producing a single impression (two side-by-side pages per sheet) of printed text. If a letter broke down, it could be removed and replaced. The Gutenberg press with its movable type brought down the price of printed materials and for the first time in history, books became available to the general public. This was a turning point for western civilization. Since that time, many advanced printing technologies have been developed based on Gutenberg's printing machine, e.g., offset, lithographic, flexographic and rotogravure printing, in sheet-fed and web-fed presses. 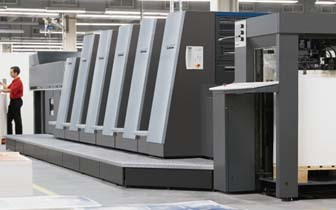 The Heidelberger press shown above is a good example of modern printing technology at its finest.